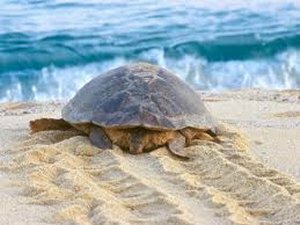 University of Algarve at Faro is studying turtle nesting on Santiago beaches. "Sea turtles are an integral part of the natural heritage of Cape Verde and historical evidence of their consumptive use by people dates back to the 15th Century. One record from Alvise da Ca’ da Mosto (1507), probably one of first Europeans that arrived to the Boavista and Santiago Islands, in 1456, states that: “we found a large number of sea turtles, whose carapaces were bigger than military leather shields, and we killed many and cooked...; finally, we salted a lot of them, that we carried into the ship to eat later”. Another report from Valenty Fernandez (Monod et al. 1951): “During the months of May June July and August there is in these islands a great abundance of sea turtles that help one recover from the leprosy illness.” Santiago Island, the largest in Cape Verde, was the first island to be settled, and the population of turtles nesting on the beaches of Santiago and in the near shore waters likely experienced high levels of human predation. Four species of sea turtles occur in and around Santiago Island, Cape Verde. The loggerhead (Caretta caretta) is the only species that has been confirmed nesting and is also encountered in coastal waters. The green turtle (Chelonia mydas) is present in the waters of Santiago, but only as juveniles. Some are captured incidentally in fisheries, and there are a few anecdotal reports of fishermen directly targeting green turtles for food, although their small size (25 to 40 cm CCL) makes them less appealing than large juveniles or adults. The leatherback (Dermochelys coriacea) is rarely sighted in the waters of Santiago, although interviews with elderly fishers suggest that they were more abundant in the past. The hawksbill (Eretmochelys imbricata) is also rare, and only records of juveniles have been reported from the waters of Santiago. Since 2002, all sea turtles and their habitats are protected by law (Decreto-Regulamentar n° 7/2002), but the consumption of sea turtle meat and eggs has not significantly decreased. National authorities are increasing their efforts to reduce sea turtle captures." "Five species of turtles visit - Green, Leatherback, Olive Ridley, Hawksbill and Loggerhead. All are endangered. Four used to lay, in the Cape Verdes but only the loggerhead still does and it is in danger. It could disappear within 8 to 10 years. Cape Verde, specifically Boa Vista, Sal and Maio, is its third most important nesting area. Between June and November females lay their eggs and 8-10 weeks later tiny hatchlings head for the ocean. After 20-30 years some will return to lay their own eggs. Turtles are protected but enforcement is insufficient to prevent killing for food and theft of eggs. Vehicles such as quad bikes driving on the beach destroy many nests. And sand extraction can remove the nesting places. Worst of all shoreline development with bright lights can trick the hatchlings into heading inshore, where they perish in scores."